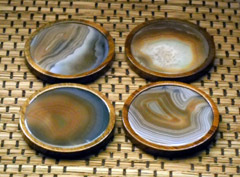 The coasters below are made from real pieces of semi precious, jewelry grade, natural agate gemstone pieces. 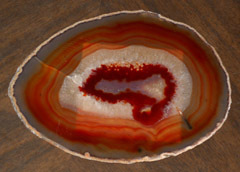 They are available in a wide variety of colors, allowing you to get the exact color of agate that will match your decorative setting perfectly. There is an almost ethereal presence to the green gemstone coasters. 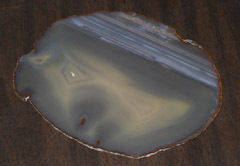 Green, being the color of nature, explodes in lazy waves of softly merging colors, all hazily placed within the semi translucent context of the agate surface of the piece. Calm, yet vigorous, these coasters are attention grabbing pieces that tend to dominate the attentions of guests and friends. 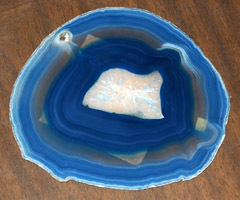 In the natural gemstone coasters seen here you will find all of the elegance, sophistication, and style of the most classic human designs, outshone and outdone by a work of mother nature herself. The way the colors intricately and unique alight upon one another is a work far too complex for any human mind to conceive of. Lovely light and airy pink, these gemstone beverage coasters are an attractive and upscale way to add functional beauty to your home. 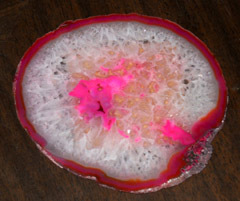 A friendly color, trapped in the translucent polished light of a semiprecious gemstone coaster face. 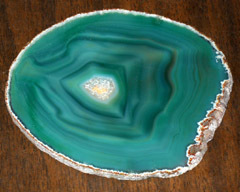 Layers of translucent flowing blues alight upon the surface of these coasters, in unique concentric rings of radiant color that burst forth from the center of the piece, drawing a spectacle of natural patterns all the way out to the trailing edge of the piece. A unique expression of functional decor. Powerful red toned hues explode across the surface of these coasters, creating a bright and crimson, amber flowing, firestorm of contrasting colors, an amazing array of light and dark that is almost kinetic, giving these pieces a powerful, eye catching demeanor.